The dawn of the new year brings with it the promises of health, fitness and family resolutions, most of which include something along the lines of eating out less, packing healthy snacks and coming up with resourceful ways to sneak extra vegetables into everyday meals. • Sneak grated zucchini into your Saturday morning silver dollar pancakes or envelope it in the rich flavor of chocolaty brownies. • Exchange regular noodles with “zoodles” (zucchini noodles) to boost the nutritional value of your pasta dinners. • Swap flour with chickpeas next time you make chocolate chip cookies! Here are some tasty favorites that would fool the family and please Popeye. Were it not for its green color you would never know that several handfuls of veggies are under this refreshing fruity breakfast or snack. Added almonds pack a protein punch. Place everything but the spinach and kale into a blender. 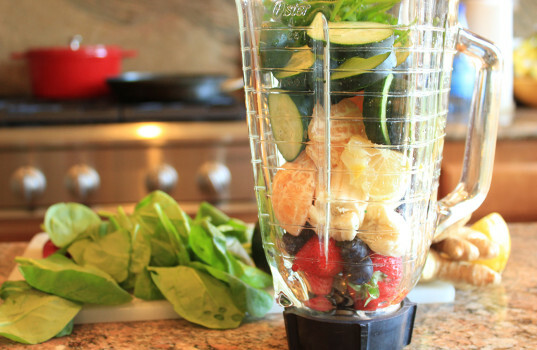 While blending, carefully open the blender’s lid and add the spinach and kale. Blend until creamy. If desired, add a handful of almonds in the last 30 seconds of blending for crunchy, nutty goodness. Serves two. Next time you pack the kids’ lunches, try replacing the usual potato or corn chips with these zucchini chips. Their light and crispy crunch work well by themselves or served with salsa, cheese or hummus for an afterschool snack. Preheat oven to 450°. Slice a zucchini into very thin slices. Toss with olive oil and salt and pepper. Spread the slices out onto a baking sheet and bake for 25-30 minutes. Allow to cool for about 5 minutes and serve, or save the chips in a baggie for later use. Sprinkle with parmesan cheese before baking the zucchini for a cheesy twist! This broccoli and cauliflower mash masks its true vegetable identity and successfully poses as the carb-rich, but undeniably beloved, mashed potato. The dish’s creamy texture easily pairs with a myriad of entrées.